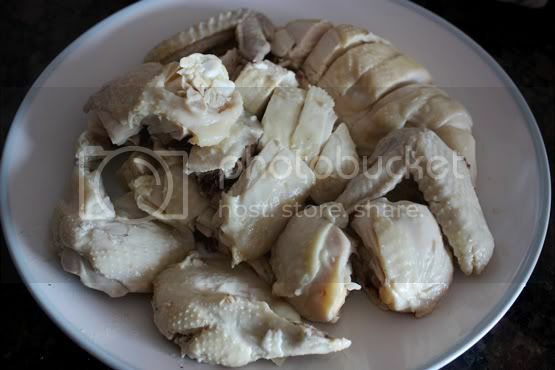 Today, I would like to share with you a curious method of preparing chicken that at a glance would seem like a case of food poisoning waiting to happen. But, it’s been done a gazillion times before by cooks like my maternal grandmother, who is half Hainanese anyway. She got this recipe from her grandmother. 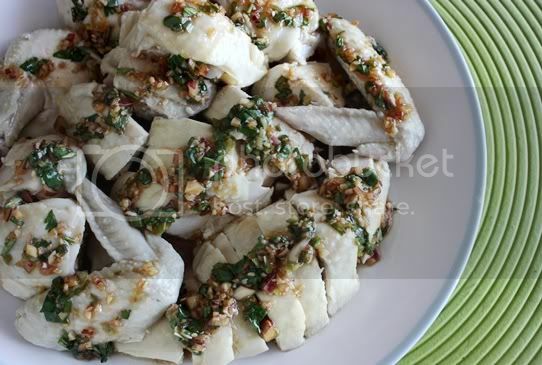 You will never say boiled chicken is boring ever again after you try this recipe. The chicken is perfectly cooked through, soft, luscious and of course, delicious to eat. This is something that my mother would even make on a regular basis for dinner because it’s so easy. 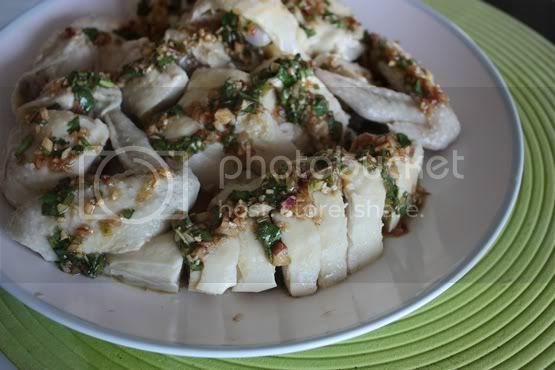 I am sure all of you would agree that most Chinese cuisine’s preparation time is always a drag. Long and tedious. But this is an exception to that. The only catch is you would need to plan this a little bit ahead of time, about 2 hrs ahead of time if your chicken is fresh and defrosted. I did not make the rice to go with my chicken because I didn’t feel like having rice with the meal, strange as it sounds. But the recipe for the rice is below, for those of you who want to try the complete Hainanese-style Chicken Rice meal. Oh and before I forget, the chicken is usually served in room temperature. Enough water to cover a whole chicken in a very large pot. Clean your chicken with running cold water. Make sure to not poke any holes in the skin. 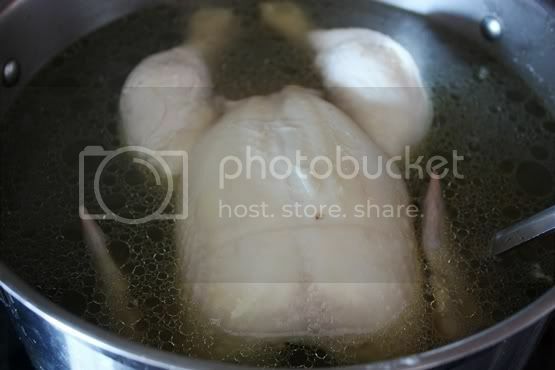 Bring a large pot (big enough to hold your chicken) of water to boil. You need enough water to just cover over the chicken. A good way to do this is fill your pot with water with the chicken in it. Once you’ve got the right amount of water, take the chicken out and proceed. Before water starts to boil, add all the ingredients in. You are doing good. Now, this is the ridiculous part. Turn off the heat completely and leave the chicken in for 1.5 hours. Do not open the lid, do not stir, do not shake, do nothing. Go read a book or shoot some zombies on your XBOX. 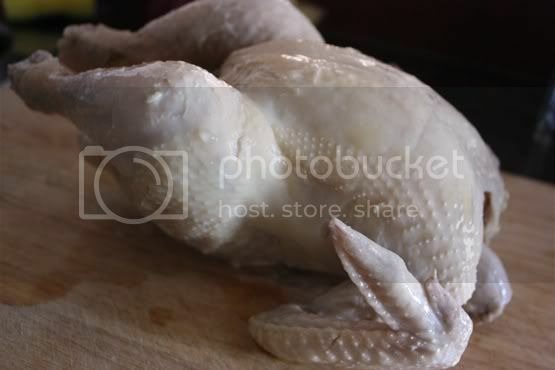 After 1.5 hours, your chicken is ready. Prepare a large sink filled with icy cold water. 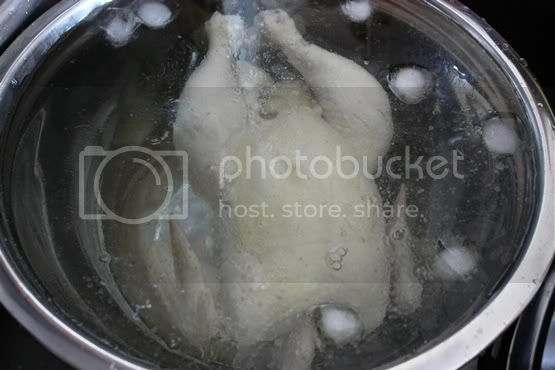 Lift the chicken gently into the cold water, careful to not break the skin as it is very fragile at this stage, hot out of the pot. To serve, my grandmother usually prepares a yummy sauce filled with herbs to go with this chicken; I will too because I can’t get enough of it. It goes extremely well with the chicken and with rice. Recipe for sauce and authentic Hainanese-style rice below. Feel free to double or halve the recipe to feed more people. Rinse the rice with cold water until the water runs clear. Strain the liquid as much as possible. In a pan, melt butter and saute garlic until fragrant. Add rice and roast the rice with the butter and garlic. This will add a dimension of nuttiness to the rice when it’s cooked. When the rice turns slightly translucent while toasting, transfer it into a rice cooker and add the rest of the ingredients in until cooked. If you don’t have a rice cooker, you can also cook this in a pot. Just make sure you lower the heat to a simmer/low when the rice starts boiling. 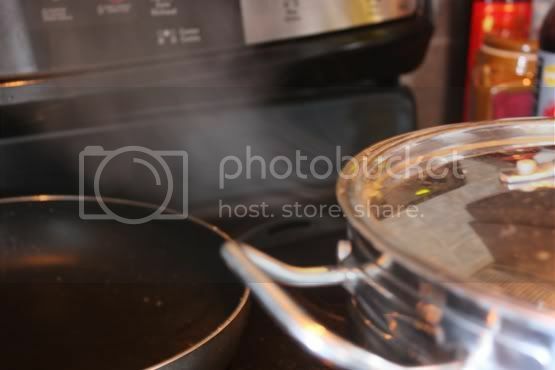 Cook for 10 minutes or until all liquid is absorbed and turn off the heat completely. Wait 5 minutes before serving the rice. Wow….my family's favourite dish. My children love this chicken rice. I can cook it now. Thanks for sharing. woohooooooooo!!! getting my chicken on Monday!!! How did the rice turn out? We just love this, luckily we get this on almost every street here. But yes, the first time I made it, I was really scared. Poked the chicken in a 1000 places after the waiting time to be sure that all the juices were running clear! The French-style "poule au pot" (literally "chicken in a pot") is also poached whole in liquid, so this doesn't seem too scary – just need to be careful… But that sauce sounds mighty delicious! And I just checked out poule au pot, it sounds yummy. Something I gotta try out soon! yummm… Will try this. But, the catch is my pot isn't big. Can I use this method on Chicken thighs? Maybe 5-6 thighs? Yum… I love chicken,, esp the sauce! Uuuh….I'm gonna try this. Thanks Elaine. Jayne: I think you can use chicken thighs too. But I am not sure about the cooking time for them because I am used to a whole chicken steeping in very hot broth. But you can definitely try. 🙂 You can try buying a smaller chicken too, something weighing less than 1.5kg but above 1kg. 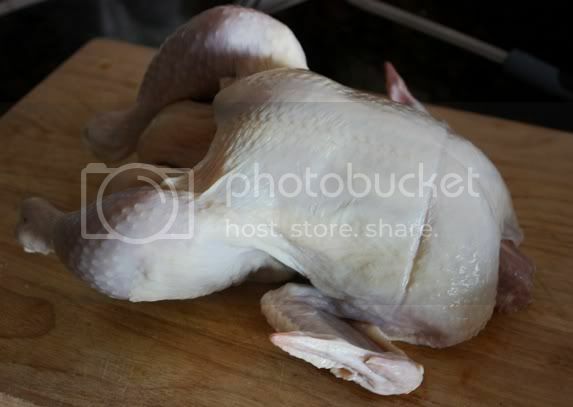 mycookinghut: I love chicken too. The so many ways to cook them! I actually made Hainanese chicken rice several weeks ago with the similar method of poaching the chicken after much researching. I serve mine with garlic chilli sauce, minced ginger, and kicap manis. Do you think I bastardized it? mykitchenfromscratch: I don't think you've bastardized it. I remember some of those chicken rice stalls using dark soy sauce to drizzle over their chicken. I'm missing the garlicky chili sauce they usually serve with Hainanese chicken rice though. Nice to know you also from Malaysia, I'm staying in Klang. I will visit you more often to check what you are cooking. I love Hainam Chicken Rice! My MiL makes the sauce with dark soy, ginger and garlic. 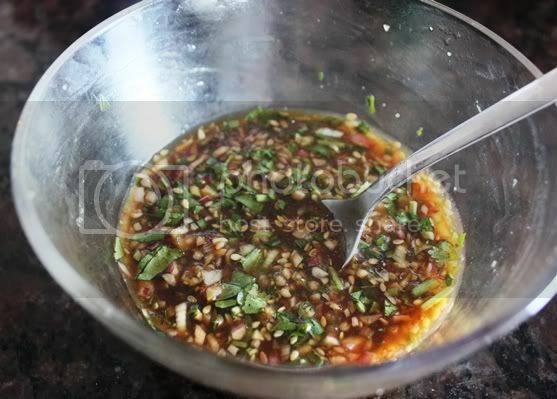 My favorite sauce is a sweet chili-ginger-garlic blend. Yum! Hi Nicole, it’s two regular cups of rice. And that’s about cups from the rice cups that comes with the rice cooker.